A host is an asset provided by Sumerian that has built in animation, speech, and behavior for interacting with users. Add a host to your scene from the asset library. 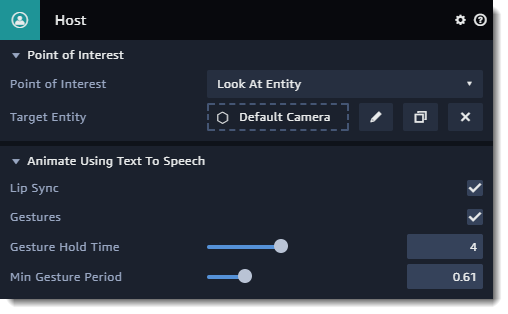 When you add a host to your scene, it includes a Host component for configuring the host's behavior, and a speech component that you can use to configure the host's voice and script. Point of interest – Set to Look at entity to keep the host's eyes trained on a camera, object, or other entity during playback. Target entity – Drop an entity here to set it as the host's point of interest. Lip sync – Play lip sync animations during speech. Gestures – Play gesture animations during speech. Gesture hold time – Set the number of seconds to play a gesture animation. Minimum gesture period – Set the number of seconds to wait after a gesture is complete before another gesture can occur.